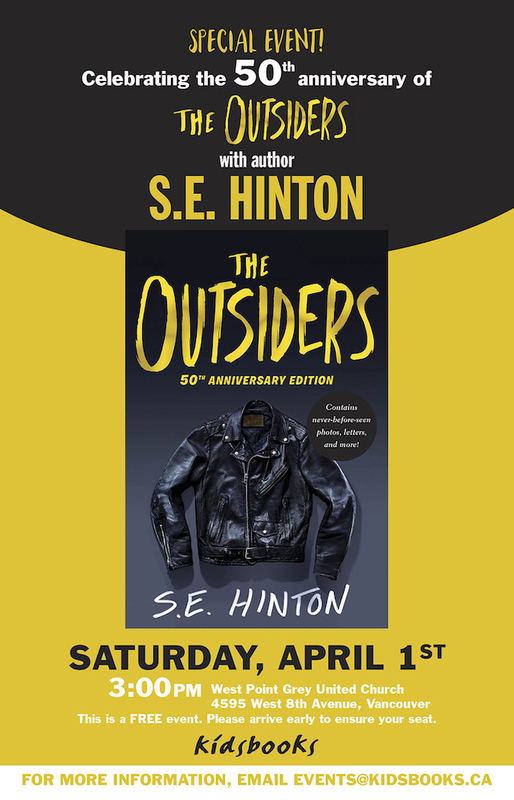 Celebrating the 50th anniversary of The Outsiders, author S.E. Hinton will be making an appearance in Vancouver on April 1st thanks to Kidsbooks. To commemorate the book and the impact it has had on so many generations of teens, Penguin Young Readers released a brand-new anniversary edition of The Outsiders. This special edition of the groundbreaking novel contains: Never before seen photos and letters from the publisher’s archives; original review clippings and media coverage; photos from the author’s personal collection; a gallery of covers around the world; new material from the stars and director of the iconic film–including Francis Ford Coppola, Rob Lowe, Matt Dillon, and others. For more information about the Vancouver event with S.E. Hinton, follow Kidsbooks on Facebook. My Humanities 8 class just finished reading your novel and are so excited to meet you!